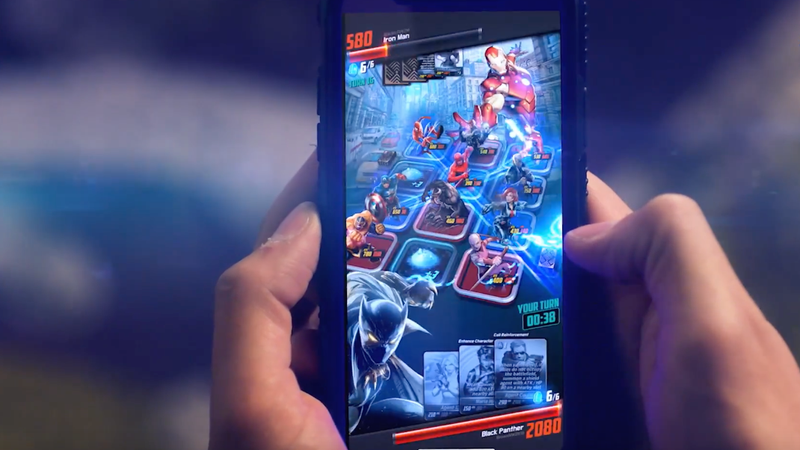 I love superheroes and reasonably dumb games I can play on my phone for free, so I’ve tried every desperate cash-in mobile game that Marvel and DC have dropped on the app store since I got an iPhone. Just in the last few years, I tried the fighting game Marvel: Contest Of Champions (nice depth but you need money to get anywhere), the teen-themed Avengers Academy (a pleasingly mindless city-builder that again required money too quickly), and Marvel Strike Force (a fun strategy-ish game with an infuriatingly busted pay-to-win economy). Recently, though, I found what seems to be a winner in the weird card game Marvel Battle Lines. Published by Nexon, Battle Lines seems pretty straightforward on first glance: Games are played on a three-by-four grid, with each player taking turns claiming a spot with one of their cards. If you make a horizontal line of three or a vertical line of four, you do some damage against your opponent. You can also use your turn to make one of your cards attack one of their cards, so it’s not just a weird version of tic-tac-toe. All right, it definitely is a weird version of tic-tac-toe, but the big twist is that most cards have a special power—whether it’s doing extra damage when you attack, buffing friendly cards, or summoning weaker cards to take up squares. Some cards are generic garbage, but the stable of recognizable Marvel heroes and villains who appear in the game is legitimately impressive—even if the X-Men and the Fantastic Four are all left out. For example, I have a deck that’s all Daredevil characters, with ol’ Hornhead himself sitting alongside Karen Page, Foggy Nelson, Elektra, and even Ikari, the assassin from Mark Waid’s all-time great run in the Daredevil comics. Foggy can’t do anything special, but the other cards all have some ability (and a snappy battle catchphrase) that aligns with who they are in the comics. It’s good fan service. What takes the game from good fan service to great fan service, though, is the Unbeatable Squirrel Girl card. In the modern Marvel comics, Squirrel Girl has earned the boastful name she gave herself by toppling all sorts of heavy-hitters with good humor and good punches, and in Battle Lines she is similarly unbeatable. Like, literally. If you play the Squirrel Girl card right, you automatically win. It sounds a little broken, and it probably is, but it’s hilarious and it suits the character perfectly. You’ll hit the money wall in any free-to-play game if you play it hard enough, but in the two weeks I’ve been checking in on Battle Lines, that hasn’t happened. That’s really the nicest thing I can say about a mobile game. Seriously, though, the Squirrel Girl card being unbeatable is a great gag, and more people need to read Waid’s Daredevil run.